In this article, we will explore options and alternatives to Shoulder Joint Replacement. We will also discuss the various non-surgical regenerative medicine injection techniques. How can I avoid shoulder replacement surgery when there are days when I think shoulder replacement surgery is the only answer? You wake up in the morning, your shoulder is killing you. No matter which way you turn, you have a problem sleeping because your shoulder hurts so bad. You get up, you stand at the foot of your bed and you begin your morning trying to figure out how far you can lift your arms up. Then you start “loosening up,” and hoping you can get by today without a lot of help from medications. Hopefully going to the toilet, washing, and getting dressed will not be a big chore and you will not have to bother your spouse or other loved ones to help you do these simple tasks. For some of you, you have to go to work like this, so you dedicate a portion of your day to figuring out pain management, altering your shoulder movements, and trying to survive. Below we will list some of the treatments options you may have been recommended to, for your degenerative shoulder disease. These treatments do help people. They do not help everyone. If you are reading this article it is more than likely you are in that group of patients who are still seeking answers despite years of these treatments and even a past history of “shoulder preserving,”arthroscopic surgery. At your last follow up visit with your orthopedic surgeon, a discussion may have taken place over whether to continue with your conservative care options. Your concern with these treatments is that have more pain, more grinding, more popping and clicking than before. You may be on Anti-inflammatory medications. (This is not something we recommend. Please see our article When NSAIDs make pain worse. Stronger Pain medications. This particular recommendation has very little long-term appeal as it can make your situation worse. Please see our article, when Painkillers make pain worse. We frequently see patients who have had surgery for shoulder pain but are subsequently left with more chronic pain after surgery. The surgeries, such as arthroscopic surgery for glenoid labrum tears, Slap lesions of the shoulder, and of course for various degrees of rotator cuff tears and damage will sometimes lead to rapid shoulder deterioration. When these surgeries fail, shoulder replacement will be recommended. So here you are, years of treatment, maybe a past surgery, you still have pain. Why? Intuitively these people know that their shoulder is talking to them. Do they understand what their shoulder is saying? Do you? Your rapidly degenerating shoulder is trying to function and survive. It is inflaming the situation. Inflammation is swelling, swelling holds the shoulder together. Your shoulder is trying to hold itself together. When your shoulder swells up. It is talking to you. It is saying “I am not stable, I have instability. I am going to swell up to hold myself together.” If you are reading this article, this may be happening to you all the time. Here is the science of what your shoulder is doing. You understated what your shoulder is doing, you can understand what is the best treatment for you. Shoulder osteoarthritis is a gradual wearing of the articular cartilage accompanied by degenerative rotator cuff tears. This pathologic (disease) disorder is related to inflammation, oxidative stress, and angiogenesis. What does this mean? What is your shoulder saying? Angiogenesis is the formation of new blood vessels. In degenerative shoulder disease, new blood vessels can be beneficial as they bring healing and growth factors to the site of injury or they can be harmful as they open new highways for chronic inflammation (chronic swelling) which eventually erodes joints. So your shoulder is telling you that it is creating more blood vessels to bring more inflammation to it. Degenerative alterations in the shoulder may prompt production of cytokines and angiogenesis-related proteins, evoking rotator cuff diseases. Cytokines are small proteins that cells secrete when they want to communicate with each other. Cytokines, while beneficial in acute injury to help heal damage, become detrimental in chronic pain situations. They sustain chronic inflammation and create more pain. How? We are going to briefly discuss a 2007 paper that researchers have heavily cited for its understanding of Cytokines that appeared in the journal International anesthesiology clinics. Here we will see that your shoulder is no longer talking but yelling at you! What all this means is that your shoulder hurts worse than it should because your shoulder is trying to get your attention. What is your shoulder trying to get you to do? It wants you to stop doing what you are doing to make it hurt. Your shoulder is under stress physical and emotional. Yes, your shoulder gets stressed out. Your shoulder is unstable. The ball and shoulder socket are banging against each other because your rotator cuff tendons, muscles, labrum and shoulder ligaments are damaged and not holding your shoulder together. Your shoulder is asking your immune/repair system for more inflammation to bring swelling to act as a “cast,” to hold the ball and shoulder socket in proper alignment. But the shoulder knows it cannot stay in a constant state of swelling. Chronic inflammation is toxic. It burns out and erodes the joint. Your shoulder is hurting more because it is trying to send you more pain signals that this situation is on the verge of joint “death,” – your shoulder will not survive prolonged chronic inflammation and will need to be replaced. Findings: Well known inflammatory factors such as interleukin 8, tumor necrosis factor α, and interleukin 1β was considerably elevated in synovial fluids of the patients. (The whole joint was highly inflamed and in a state of erosion). The joint inflammation highly enhanced insulin-like growth factor 1 and transforming growth factor β1 (TGF-β1) in the synovial fluids and serum. You may be wrestling with the idea of shoulder replacement because you are a worker who needs to work. Shoulder replacement brings with it possible hope, but it also brings with it, the risk of surgery, possibility of complications, surgical recovery and rehab time. Often we will see a patient who says, “I went to two reputable orthopedists, both said surgery was the only way.” Below we are going to show you research that surgery is not the only way for many people. Surgery is usually the only way when the shoulder bones are fractured or there is gross anatomical failure. Why? Because of poor tendon healing and irreversible changes associated with rotator cuff inflammation. Stem cells used during the course of surgery – Many of you reading this article may have already had a consultation for shoulder surgery. The surgeons may have advised you that they were able to bring stem cells into the surgery to facilitate healing. We address this in our article My surgeon wants to use Platelet Rich Plasma and Stem Cell Therapy during surgery. Some doctors suggest shoulder replacement surgery may make things worse – shoulder replacement recovery time – complications are often lengthy and sometimes never go away. Researchers from Texas Orthopedic Hospital, the University of Houston, University of Texas, who released their findings and documented that the number of shoulder replacements being performed has increased exponentially in recent years, with a corresponding increase in the number of second surgeries to fix the first one. In patients surveyed for this study: 21.6% (8/37) required reoperation for postoperative complications. Overall, 54% of patients (20/37) suffered from intra- or postoperative complications. This, of course, will throw a big concern at patients – shoulder replacement recovery time – complications are often lengthy and sometimes never go away. Understanding the reverse total shoulder replacement and conventional shoulder replacement surgery. For these patients, conventional total shoulder replacement may result in pain and limited motion. Therefore a reverse total shoulder replacement may be suggested as an option. The procedure sounds exactly as it is named. In a traditional shoulder replacement, a plastic “cup” is fitted into the shoulder socket (glenoid), and a metal “ball” is attached to the top of the upper arm bone (humerus). In a reverse total shoulder replacement, the socket and metal ball are switched. The benefits of the reverse procedure are studied in a paper published in the medical journal Orthopedics. The paper suggests that a reverse total shoulder arthroplasty is better suited for older patients with glenohumeral arthritis and a deficient rotator cuff. However, as a semiconstrained prosthesis, (that is implants which create artificial stability by limiting the prosthesis range of motion) a conventional reverse total shoulder replacement in a young patient could fail over time because of the polyethylene wear and subsequent osteolysis – the joint replacement causes accelerated bone loss. Another study from Dr. Pascal Boileau of the Department of Orthopedic and Sports Surgery Pasteur 2 Hospital, University Institute of Locomotion and Sports in France examined outcomes and complications in young patients undergoing revision reverse total shoulder arthroplasty (RTSA) for failed prior total shoulder arthroplasty or ball replacement and compared them with those of older patients undergoing the same procedure. Shoulder replacement infection: In another study, doctors say that one of the greatest risk factors for infection after shoulder replacement were history of a prior failed shoulder surgery. So replacing the shoulder in an attempt to fix the first shoulder surgery had a high risk of infection. Doctors from the Mayo Clinic writing in the Journal of Bone and Joint Surgery discuss the problems of obesity causes in patients after shoulder replacement surgery. Increasing Body Mass Index (Obesity) was associated with an increased risk of the need for a second or revision surgical procedure, reoperation, revision for mechanical failure, and superficial infection. Increased BMI was also associated with an increased risk of revision for mechanical failure. The most marked association between increasing BMI and any complication in shoulder arthroplasty was its association with superficial wound infection. In regenerative injection techniques like Prolotherapy, Platelet Rich Plasma Therapy or Stem Cell Prolotherapy, the goal is always to preserve and regenerate these cushions and connective tissues rather than remove them. It makes our job here at Caring Medical a little more difficult when treating a patient who has had an extensive procedure, but it is still possible to achieve healing after surgery. 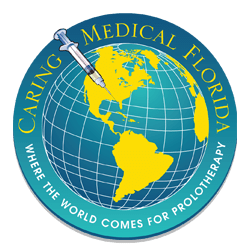 The videos above and below show and describe both the Prolotherapy and PRP injection techniques we offer. Below we discuss the science. In the same manner, we present research on shoulder replacement surgery, we would like to present information on regenerative medicine injections. Our focus is on simple dextrose Prolotherapy as the first course of action. In more problematic cases, we may rely on Platelet-rich Plasma injections or bone marrow concentrate commonly referred to as stem cell therapy. 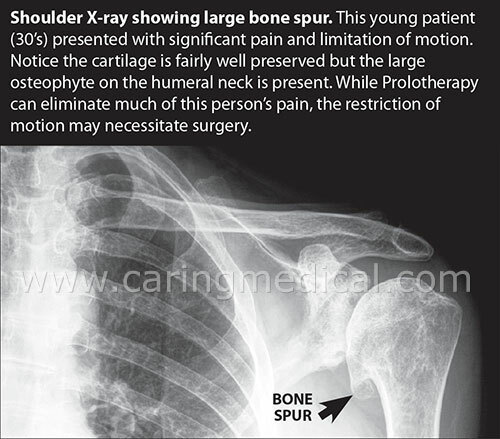 Dextrose Prolotherapy, as described in the video above is a series of injections that stimulate inflammatory healing that reboots the shoulder’s repair process. First we will look at the learning points of Caring Medical research. 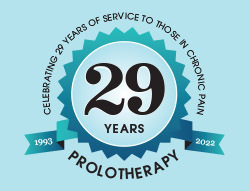 The results of this study showed that patients had a statistically significant decline in their level of pain, stiffness, and crunching sensations (crepitation), with Prolotherapy, including the 39% of patients who were told by their medical doctors that there were no other treatment options for their pain and the twenty-one percent who were told that surgery was their only option. Over 82% of all patients experienced improvements in sleep, exercise ability, anxiety, depression, and overall disability with Prolotherapy. 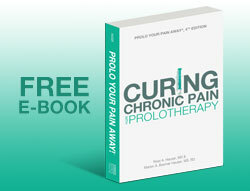 Ninety-seven percent of patients received pain relief with Prolotherapy. Conclusion: In this study, patients with chronic shoulder pain reported significant improvements in many clinically relevant parameters and overall quality of life after receiving Hackett-Hemwall dextrose Prolotherapy. In our research, published in Clinical medicine insights. 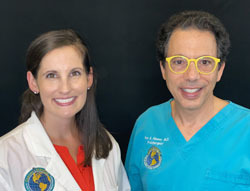 Arthritis and Musculoskeletal Disorders, (12) Ross Hauser, MD and Danielle R. Steilen-Matias, MMS, PA-C contributed to findings suggesting Dextrose Prolotherapy has been able to reduce pain and disability of traumatic and nontraumatic rotator cuff conditions. Research revealed that treatment of moderate to severe rotator cuff tendinopathy due to injury with injections of hypertonic dextrose on painful entheses (the ligament and tendon attachments to the bone) resulted in superior long-term pain improvement and patient satisfaction compared with blinded saline injection over painful entheses, with intermediate results for entheses injection with saline. In the journal, Alternative Therapies in Health and Medicine, (15) doctors presented a case study at the Medical Center at Southwest College of Naturopathic Medicine in Tempe. Here a middle-aged male with a long-term history of untreated shoulder pain received injections into the glenohumeral joint space, the acromioclavicular joint, the subacromial space, and the insertion of the supraspinatus. Results: Following 3 sessions of prolotherapy, the patient reported a 90% reduction in pain and full restoration of normal activity. The findings suggest that dextrose prolotherapy may be an effective treatment for chronic shoulder pain and may be an alternative to surgery or other more costly and invasive interventions. A March 2019 study in the Journal of Ultrasound in Medicine (16) found that ultrasound-guided prolotherapy with a 15% dextrose solution is an effective and safe therapeutic option for moderate-to-severe acromial enthesopathy and acromioclavicular joint arthropathy. Will these injection treatments help you avoid a shoulder replacement? Caring Medical Regenerative Medicine Clinics have over 26 years of experience is helping patients avoid surgery. Once we do an examination on the patient we give a clear picture of what he or she can expect from our treatment. Sometimes we are very optimistic that we can offer a lot of help. Sometimes someone comes into our office with shoulder osteoarthritis and rotator cuff damage significant enough that the reality of the situation says surgery and we recommend the surgery. How would you know who you are? An examination usually does a great job determining that. Even if you have been told surgery is the only answer, which we addressed in the research above, we have done countless second opinions where we were able to provide the patient non-surgical options for their shoulder damage. If you have questions and would like to discuss your shoulder pain issues with our staff you can get help and information from our Caring Medical staff.